Many people in Madagascar have a very low income which barely covers the basic needs of a family. It gets worse when this income fails due to illness or loss of a family member. We try to help these families who have suffered such a loss and are no longer able to provide their loved ones with whats needed. With only 10 Euros monthly we can ensure that a family of 4-5 people has food, water, clothes, medication (when needed) and that the children can go to school. 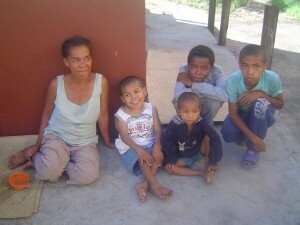 The donations are used by our team on site, in cooperation with the local nuns, to buy what is needed. We only give the families the things bought; we never hand out money. On request we can provide our donors with regular updates of the families they support.